Cusco The regular readers are going to pass this blog by and that’s far enough, but I’m going to lay out some travel tips as a public service of sorts for some of the 400,000 visitors to Machu Picchu, one of the wonder’s of the world by any reckoning, who happen to check the internet for advice and Google search in despair. With board and staff meetings all the coming week for ACORN International in Lima, my daughter, Dine’, and I jumped up to Cusco for the weekend to journey to Machu Picchu. She had throughly researched the entire trip, but we still got to Cusco scratching out heads when it came to the real details of taking the train to Machu Picchu, so here’s what we discovered en route. Remember there were severe mudslides that have wiped out sections of track up and down the route (one can see track in the water from the train), so throughout 2010 there have had to be adaptations for travelers once Machu Picchu opened up again. Guidebooks are not up to date obviously, and folks in Cusco are in the service industry with an unclear sense of what we might want to know. First, absolutely no one knows where PeruRail is located! Even buying tickets at the Institute National Cultural (INC) which is 2 blocks or so south of Plaza de Armas (soles only! ), the advice was terrible and included unhelpful suggestions that we would have to take a bus to the midpoint or so and ignore our previously purchased tickets. We asked perhaps a dozen people where we might find PeruRail so we could rest easier since our train was scheduled at 5:10 AM. I will spare the general wave that it was a couple of blocks away, and get to the point. PeruRail is all the way down at the bottom of El Sol from the Plaza de Armas. Walk downhill to the small park which is at the intersection of El Sol and Tullumayo. The park is regularly pointed out because it is the head of the puma and Cusco is built along the shape of the puma. Crossing through the park walk down the wide street to the left about 100 meters and you will surprisingly come to the gate marked PeruRail. The guards are helpful! This turns out to be a bus stop basically. All maps that mark the rail stations to Machu Picchu are wrong because they are pre-mudslide. The guards told us to get to the station at 5 am for the 510 AM. We got there at 450AM, and they were right. We opened up the place. The advantage was that we were on the first of the passenger vans (15-passenger buses) to pull out to meet the train. Dress warmly! In the early morning the defrosters work on the coaches, but in the local habit a rug and mats are kept on the dash, so the only way the windows are defrosted is “old school,” with handkerchiefs and window wide open. This gets nippy, especially because this is not a short trip, and the window is never completely closed. The train to Machu Picchu is basically now a bus trip with a train finish. The route is roughly a two and half hour roll (2 ½) out of the Cusco valley and then along pavement until the final stretch on a dirt one lane road with the track in sight much of the time. This is a bit hairy. At one point we had to go in reverse for quite a space so that a van caravan coming from the real train could pass by. Leaving at roughly 510 AM, we arrived at the train rendezvous about 735. PeruRail has open benches there with cushions and a banos, but no other services. Our train turned out to be set for 810 AM, so there’s a wait there as well. When finally boarded, the train is beautiful and a pleasure. The ride is one hour and twenty minutes (1 hour 20 minutes) up the canyon to cover seventeen (17) miles. Arriving is confusing because you have to wend your way through the tourist shops without signage until you find your way out and see more buses down below. This is another opportunity to spend money, because you need to pick up bus tickets here to Machu Picchu. The buses are excellent and run as fast as filled for 25 minutes up the mountain to the historical site. It’s then a very shot walk into heaven. Leaving at 510 we were at the turnstile presenting our tickets (we had to stop and fill them out!) and passports at 10 AM or so, relieved after our five hour trek. All good, but also all surprising since we had not been able to really figure it out until it was said and done. Coming back was more of the same. PeruRail indicated that we needed to be 30 minutes early. 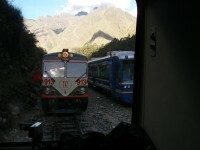 In fact the train left the Machu Picchu station about 30 minutes after schedule. We also needed to stop for a bit near journey’s end on the train behind the two car Inca Rail train in order to allow the inbound PeruRaill train to pass through. Once there, it was back up the hill, back on the vans and another roll through the dark to Cusco, which we clocked at another 5 1/2 hour jaunt. Machu Picchu was worth every minute and every soles of all of this, but the old Eagle Scout in me and the hours my daughter had spent putting all of this together (props, Dine’! ), couldn’t resist writing this down so you’ll be more prepared and less anxious about the whole trip than we were. Machu Picchu must be on everyone’s Peru tips. And for good reason! It is a complete Inca city. For centuries, it was buried in jungle until it was stumbled upon by Hiram Bingham in 1911. There are staircases, temples, terraces, houses, towers, fountains, drainages, the famed Intihuatana. Do wander around Machu Picchu for more than a day. In this way, you can take things in more deeply. Machu Picchu IS MAGICAL!!!! Not only the masonry, and the gigantic rocks will wow you, there are water channels to happen upon and the surrounding impressive mountains to gape at. If you are still up for it, hike up Huayna Picchu, the mountain overlooking the site. It is very steep and the steps are quite dangerous, so do be warned if you are afraid of heights or are very tired from the trail. According to my guide, there are still many Incas’ ruins in the jungle. But, I guess it’s best that they stay that way because it is difficult to maintain them (they’re in the jungle after all) and they will be inaccessible anyway. Tourists are not archaeologists after all.